Simon Says Stamp’s Flickr Challenge #27 requires the use of complementary colors. You can choose any 2 complements on the color wheel. I chose purple and yellow for my colors on this project and used different intensities of the two colors. 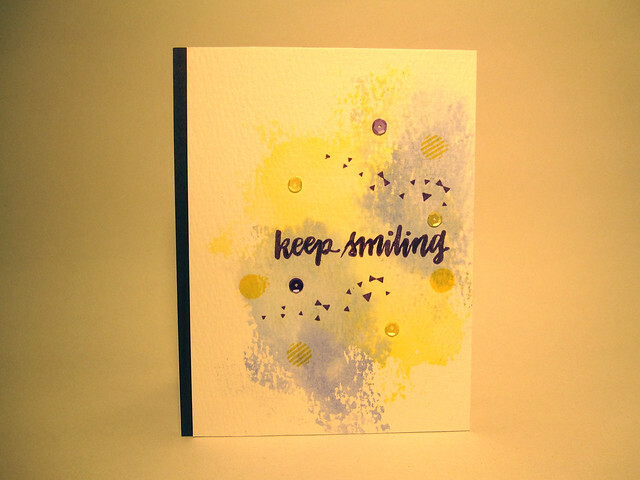 Using Distress Inks in Squeezed Lemonade and Shaded Lilac, I used the smooshing technique as demonstrated by one of my favorite card makers Laura Bassen. The two distress inks are soft colors and I wanted to keep them that way on the front of the card since they were going to be my background colors. After I smooshed the colors around to my liking, I let them dry with a little extra help from my heat tool. I then added the sentiment stamped in a darker shade of purple so it would stand out and then stamped little circle images and triangles in purple (same shade as the sentiment) and a deeper yellow so they would stand out slightly against the colors used in the background. I added yellow and purple sequins for a little more sparkle to balance out the design of the card front. There you have it. I hope you like the card. The overall effect is a softer look, but I like the subtlety. Stamps: Simon Says Stamp: Hand Lettered Encouragment (for the sentiment); Simon Says Stamp: Birthday Bits (for small triangles and circles). Inks: Distress Inks: Squeezed Lemonade, Shaded Lilac; Memento Inks: Grape Jelly, Dandelion. Other: Avery Elle Sequins: Lemonade, Royal Purple. This entry was posted in Challenges, Encouragement and tagged Challenge, Simon Says Stamp. Bookmark the permalink.